When we talk about toy class drones, none represent the label better than a nano drone. These mini flying quadcopters are often smaller than the palm of your hand, and elicit laughter as they buzz around your living room. As you might imagine, there are quite a few of these tiny drones out there, ready to drive your house pet insane. Join us as we explore some of the better options, some of the best nano drones available today. The best part about these nano drones is that none exceed the 0.55 lb weight limit imposed by the FAA. You will not have to register these things. The downside, they are so small that you are almost stuck to flying indoors. The ones we’ve tested are fairly crazy little things, they’ll be all over the place as is, you don’t need wind causing extra difficulty. For the most part, you are looking at inexpensive toys with very few offer flight assistance features, this is all skill. They are usually fairly under-powered as well – they’ll zip around fast enough, but you’re not likely to take off with a camera, for example, and they are likely not strong enough to fight a little wind. I cannot rightly call any of the nano drones on our list ‘tools,’ they are all toys. Having said that, let’s go have some fun. 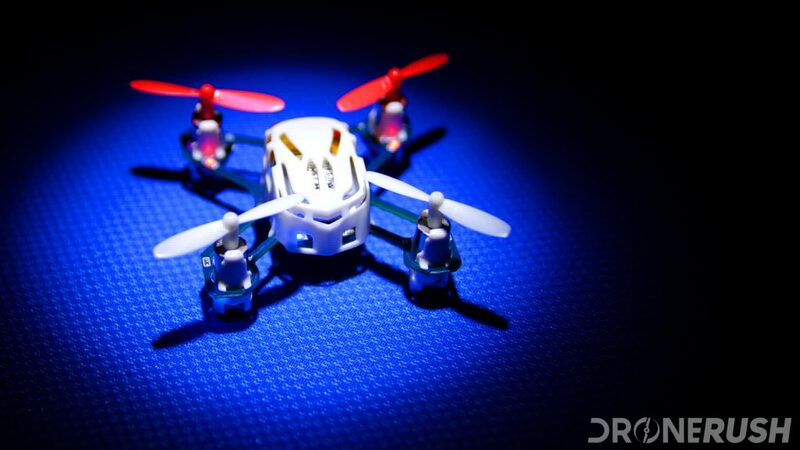 First up is the nano drone sitting on my desk, the Hubsan X4 H111. This little thing is a blast to fly, but also the most difficult drone I own. Powering up gently will lift the drone off the surface, but it is not until you really throttle up that it takes into the air. You will have to constantly adjust the throttle to maintain adequate elevation, and the thing seems to have a mind of its own sometimes, be ready to steer all over. 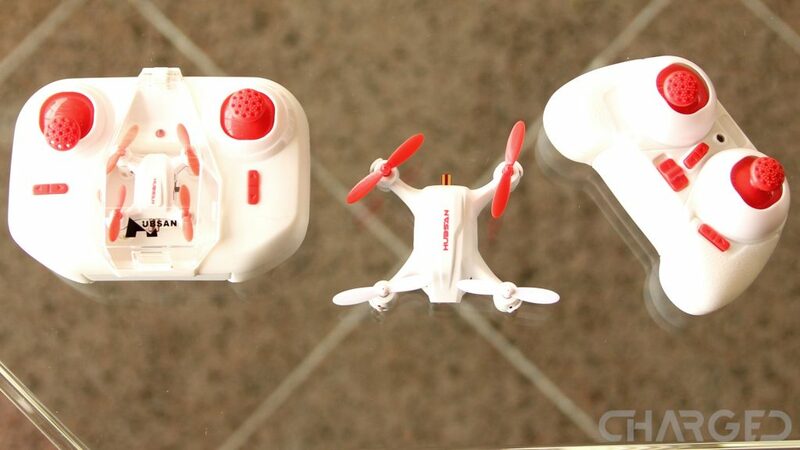 With a tiny remote control, this is a feature-rich, reliable and resilient flier. I am not going to say you can’t hurt it, but it can certainly take a bump, or crash landing, and get back up without complaint. Check out the Hubsan X4 H111 for $18 on Amazon today. 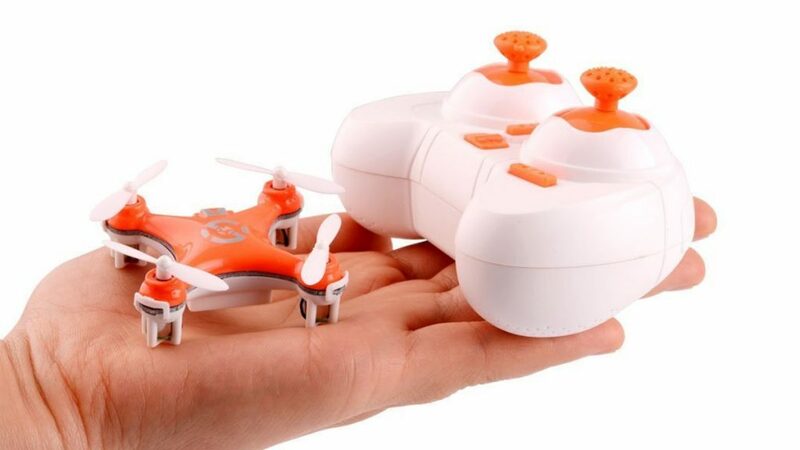 Syma, one of the top brands in the toy class segment, has a nano drone worthy of your consideration, the X12. 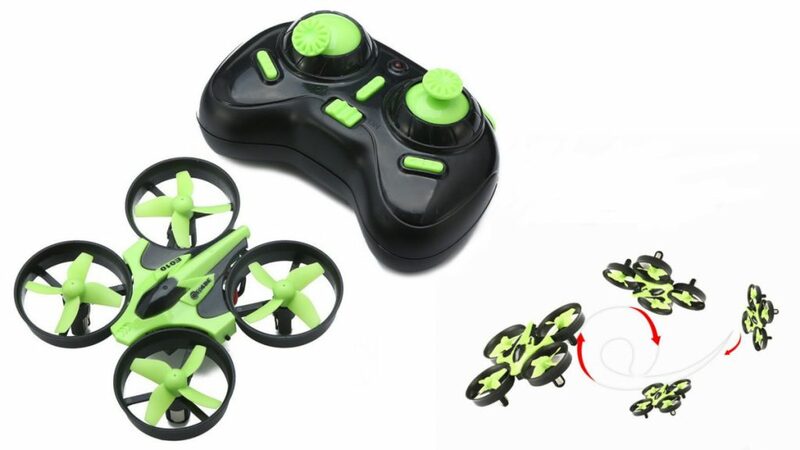 Along with the 4 channel remote control, you’ll be doing flips with this tiny quadcopter in on time. I mean that literally, the drone has an ‘eversion’ method that flips the drone in mid air. You’re looking at about 5 minutes of flight time per charge. 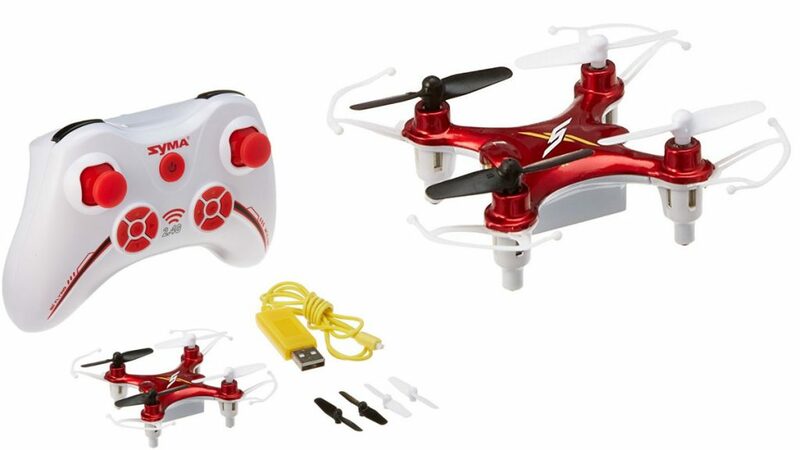 Check out the Syma X12 nano drone for $25 on Amazon today. Continuing with the familiar design of being a tiny little quadcopter, the Cheerson CX-10 has three levels of adjustable speeds and more. Headless mode eases the grief of learning to keep the front in the front as you enjoy about 5 minutes of airtime. 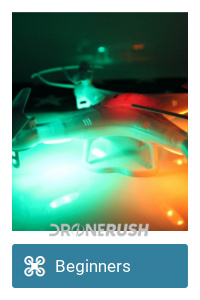 Coincidentally, you can get the updated version of this drone, with FPV camera, on our partner site Android Authority. Check out the Cheerson CX-10C for $24 on the AA Deals store. Check out the Cheerson CX-10 for $19 on Amazon today. One of the more unique drones on our list, the Eachine E010 looks like a little race car. What really sets it apart is that it comes with substantial propeller guards and an aggressively pitched four-blade propeller. I’m not going to pretend that this is a huge departure from the others on our list, but it is still abnormal to see fan blades in place of little props. The Eachine E010 offers return to home functionality, the ability to flip and headless mode. Check it out for $24 on Amazon today. Let’s take a look at the Uvify OOri. 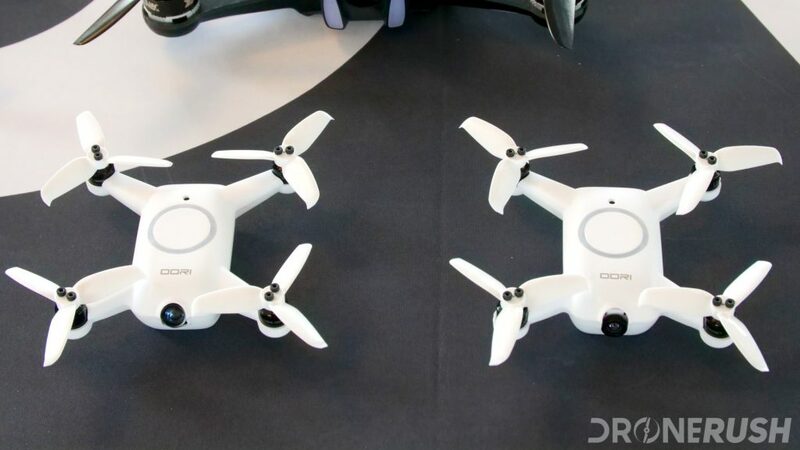 We’re stretching things a little here, the rest of the list are drones that can fit two or four in your palm, that makes the OOri almost four times larger, as you’ll fit just one in your palm. That said, we are very excited about this drone, it is one of the most capable machines we’ve seen in a small size, both in terms of smooth and stable flight, and in speed. 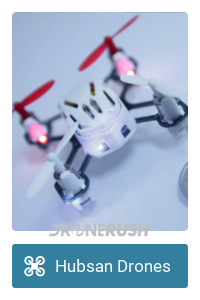 In beginner mode, you’ll fly OOri in your living room, just like the nano drones on this list, but then you’ll unleash the power and get upwards of 60 mph at the race track. 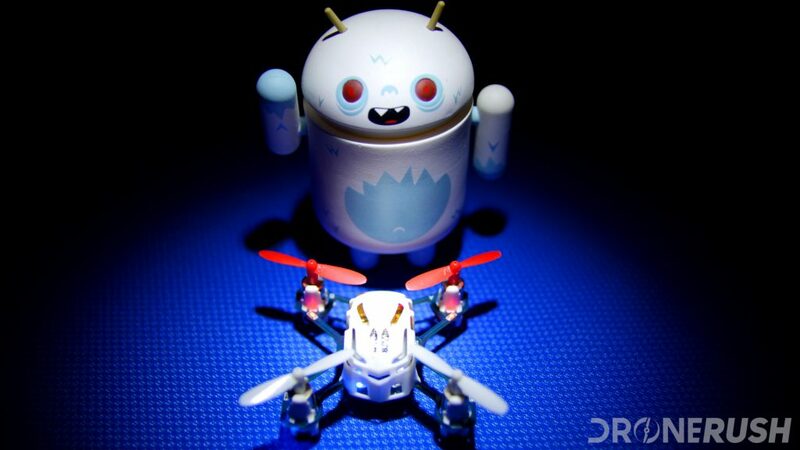 This is a drone you can grow with, not just a toy for bumping around the living room. As I say, we’re pretty excited for OOri. Due to start shipping by mid-2018. Buy the Uvify OOri for $345 now. That’s all we’ll look at today folks. We know there are many, many nano drones on the market, just hit your local electronics store, or grocery store for that matter, and you’re likely to find a flying toy able to fit in the palm of a child’s hand. Due to the basic abilities of these little fliers, you are best to look for quality parts more than a known brand. Many of these small drones are cheap drones. Motors burning out and poor connectivity are one thing, but poorly constructed cables and connectors pose fire hazards, please monitor your purchase and consider purchasing a LiPo bag for safety. I use this Apex RC Products Lipo bag for $12 on Amazon. In the end, these are hugely fun little machines. They are very safe for most children to fly, respecting the posted age limits, of course. The real thing here, most of the toys in this segment are made to be disposable – very hard to repair, possibly no parts to be found and made of simple materials. We hope our recommendations serve you well, and please fly safe in the house. What is you favorite nano drone?